Do you ever struggle to tell your left from your right, maybe when driving or giving directions? If so, you're not alone as evidence suggests a significant proportion of the population has difficulties. Usually, it's not a big thing. But, in medicine, adverse events caused by left-right issues can have serious consequences. A new study from Queen's University Belfast has questioned the idea that determining left from right is effortless for everyone. It has said that medical education should respond by raising awareness about the challenges some medical students face. In addition to the many checks and balances in healthcare to prevent such errors, the study has also called for greater support to be extended in medical students training. Mr Ian Walsh is a surgeon and an academic at Queen's. While re-creating a simple investigation with a group of fourth-year medical students, he illustrates how left and right awareness come into play in everyday situations for medical professionals. He shows them an X-ray of a set of lungs - the left lung has fluid in it. 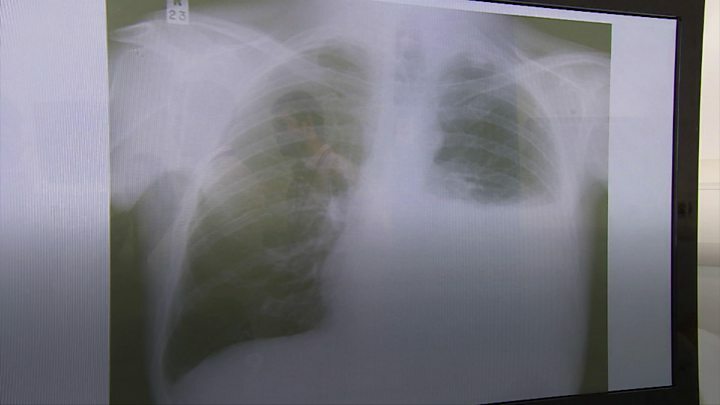 As viewed straight on, the 2D X-rays appear to flip the left and right sides - in that a student will see the left-hand lung on the right side of the screen. It's vitally important that the medical students are aware of this and also examine the patient themselves before they proceed to treat the patient by draining the lung. The new research paper, which is to be published in the journal Medical Education, was led by Prof Gerry Gormley from the Centre for Medical Education at Queens. It looked at how, for some of us, making left-right decisions is simple - but for others is it's much more problematic. "In terms of spatial awareness, generally we don't confuse above and below, behind and in front - but left and right can pose a challenge for some people. "It's a relatively under-researched area and still there is a lot to be known about this particular topic. "We know that many individuals can, without thinking, determine the correct side. "However, for others they have to go through a complex process and use many higher functions to discriminate left from right." So this simple skill is actually more complex than it first appears - and it's crucial those in medicine get it right. Dr Carl Brennan also worked on the research. He said that some students developed their own coping mechanisms. "One of the most common common ones can be with their hands - where on their left hand they form the 'L' shape. "There are a number of others - wearing their wristwatch or wedding band on their left side or writing with their right." Queens University is at the forefront of a field of study called Human Factors. Simply put, in healthcare, it looks at how professionals best interact and behave with their environment, equipment and other people in the interests of patient safety. It can show medical professionals how best to communicate in teams and effectively handover increasingly complex information to others in healthcare. Mr Walsh explains its application to left-right issues. "This addresses beyond the more technical issues - for example where you mark the right limb to make sure you take off the correct limb, for example. "It looks at improving quality by looking at how we behave, how we think and how we interact." Prof Gormley said it's important to translate this type of research into practice. "In our future simulation centre, in addition to what we are already doing we can bring students together with drama students, for example. "They can really re-create challenging situations but also the emotions and the situational awareness so that our medical students can convert their thoughts into correct actions to hopefully reduce error and deliver high quality care."